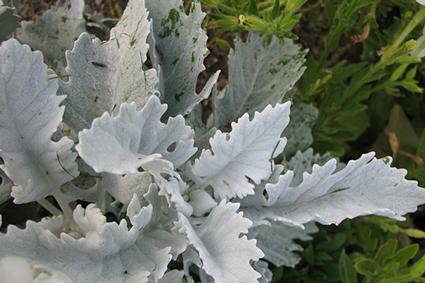 Dusty miller is a reliable foliage plant for the perennial border. Grown more for its felty grey leaves and tidy form than its flowers, it is a muted contrast for the cacophony of color that a flowerbed often becomes by mid-summer. At home in full sun or part shade, dusty miller grows into a compact mound about one foot tall and two feet in diameter. Its silvery leaves are covered in fine hairs and are finely divided in a fashion similar to many fern species. It grows as an annual in any climatic zone, but survives as an evergreen perennial where temperatures do not dip below 10 degrees. Though not tolerant of extreme cold, it is tolerant of drought, making it a great candidate for xeriscaping. 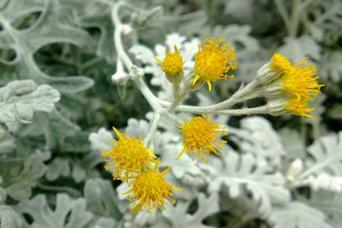 The yellow flowers are not the main attraction with dusty miller, though they pretty in their own right, if small. They rise on short stems above the foliage in late summer and fall. Use dusty miller as an annual bedding plant, as edging around flowerbeds or along paths, as a groundcover under small flowering trees, or as a filler in perennial borders. It is also useful in planters and hanging baskets to fill in the spaces between upright specimens. Dusty miller is a fast grower capable of reaching its full size in one growing season, making it a good choice where instant cover is needed. It is only suitable for well-drained planting areas and grows vigorously in poor rocky soil. Dusty miller is a very low maintenance plant. It needs a little water to get established, but little else. In the fall, shear the top quarter of the plants to keep them looking compact and tidy. Insect pests aren't much of a problem with dusty miller though it is prone to fungal diseases, mainly root rot, in moist environs. With well-drained soil and sparse irrigation this usually isn't a problem, but it's best to avoid mulching around the stems of the plant as this can encourage the disease. 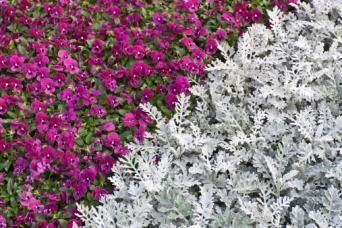 There are a few different varieties of dusty miller available, each with subtle differences. 'Silver Dust' is a bit shorter than the basic species and has finely, divided, almost lacy foliage. 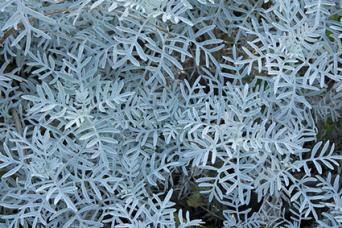 'Silver Lace' is a full size plant with petit finely divided leaves. 'Cirrus' has foliage with rounded edges as opposed to the many forms with tips on the leaves. 'Diamond' is a dwarf form with leaves that are nearly white. With its greyish foliage, dusty miller provides a unique Mediterranean look in the landscape and is right at home with olive trees and lavender. The tiny hairs covering the leaves make them appear almost white in the sunlight and causes the plants to glow brilliantly in the moonlight.